So as i mentioned the other day i'm joining in the 33 day challenge.. all be it a little late. 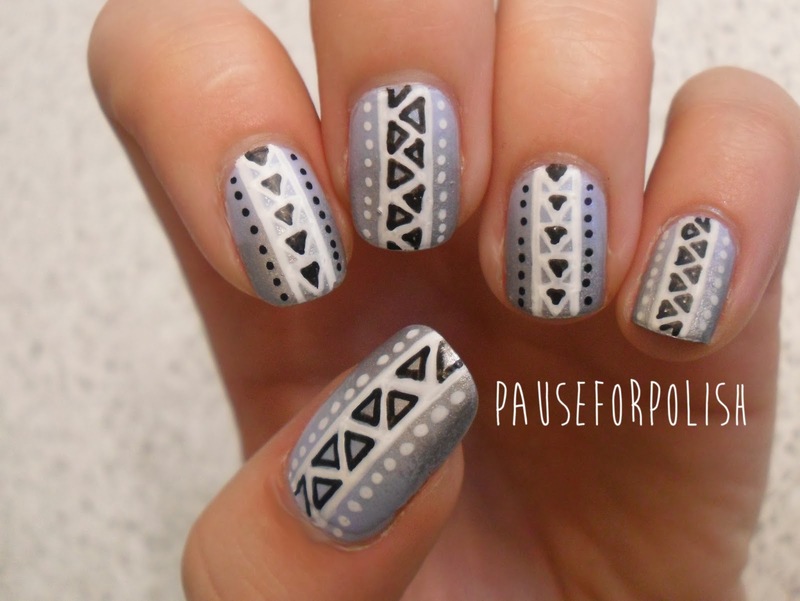 Here is my first entry with a tribal inspired manicure. Now i'm not gunna lie.. i'm pretty disappointed with this one. 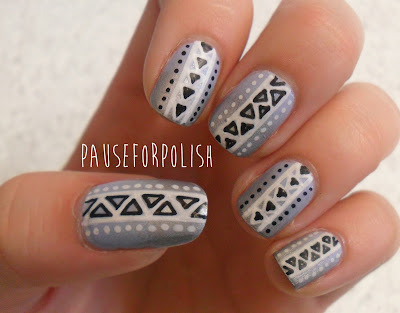 Aztec/tribal nails are my favourite to create, and for some reason this just didn't work for me. I don't know if it's the design, the colours or the fact i did this whilst extremely hungover and couldn't stand the polish fumes any longer. Still, no one is perfect and i know that this challenge will probably bring out the best and worst of me.. but that's why it's called a challenge huh? So here are the terrible photos of the terrible manicure in all their terrible..ness. I'm literally shuddering at the thought of posting this.. they look futuristic?! Damn my colour choices. Damn you hangover. Okay guys, i swear i can do better than this! Lets summarize this as quickly as possible and then i can try to redeem myself on Wednesday. Two coats of Maybelline, silver Barry M gradient, Barry M nail art pens, Seche Vite top coat.. boom. Oh Yeah, Wait A Minute Mister Postman! I Challenge You Not To Challenge..? All photos and opinions in this blog are my own. Simple theme. Theme images by enjoynz. Powered by Blogger.